TAR CREEK is the story of the worst environmental disaster you've never heard of: the Tar Creek Superfund site. 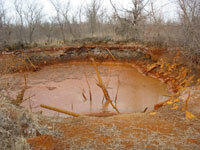 Once one of the largest lead and zinc mines on the planet, Tar Creek is now home to more than 40 square miles of environmental devastation in northeastern Oklahoma: acid mine water in the creeks, stratospheric lead poisoning in the children, and sinkholes that melt backyards and ball fields. Now, almost 30 years after being designated for federal cleanup by the Superfund program, Tar Creek residents are still fighting for decontamination, environmental justice, and ultimately, the buyout and relocation of their homes to safer ground. As TAR CREEK reveals, America's Superfund sites aren't just environmental wastelands; they're community tragedies, too...until the community fights back. "A powerful film showing a tragic situation for everyone who lives in the region...It is tragic that the non-Native residents of the town of Picher must leave their homes because of the failed efforts to clean up the site, but even more a case of environmental injustice that members of the Quapaw tribe, who were forcefully moved to this region from Arkansas a hundred years ago, must stay behind and continue to be exposed to lead." "I found Matt Myers' Tar Creek a complete revelation, a much richer and more tragic story than I had ever been aware of. Only a carefully organized visual presentation like his can vividly bring to life, for a general audience, the blend of science, economics, politics, history and raw human misery that are bound up in an environmental disaster of such scale. Students viewing it will certainly grasp both the extreme care required in the extraction of vital resources and the potentially devastating costs of carelessness." "Deeply moving and compelling. A tragic story of environmental degradation and community disintegration, layered on historical uprooting of Native Americans. The current health threats to children and the heart-breaking relocation and buy-out of families are contrasted against legislative and bureaucratic absurdities in this stunning documentary...Mining operations in this region of Oklahoma were both an environmental assault and a cultural assault. The film makers and those who were interviewed have done a tremendous service by presenting the many lessons to what I hope is a large audience." "A moving film with a powerful message. Many of our basic industries may have provided us with solid benefits at one time but they have also left us with a hell of a toxic legacy. Our need for job creation will never be more important than our need for an ecologically sustainable economy. In fact, these two goals are inseparable and must always be so. Tar Creek confirms this lesson through a tragic story, but also points us in the right direction: We need to rethink our economy from the bottom up and ensure that we never compromise the health of our children and our environment for short-term financial and political goals." "Highly Recommended...Heart-breaking...Provides a good balance of the facts and personal perspectives from local leaders, townspeople, archives, government representatives, public health officials, and tribal leaders. Many viewers could benefit from the scientific and political lessons learned as well as hearing the passionate perspectives of the communities directly impacted. Appropriate for most high school students and adult audiences, the film should be of great interest to students and advocates interested in environmental justice, public health, policy, and environmental management issues." "Tar Creek is a stark warning against corporate greed and expensive, destructive, and community-destroying environmental catastrophes. Highly recommended, especially for public and school library collections." "Powerful and disturbing...A sad tale about what a country will do to itself, and to its powerless native peoples, for the pursuit of wealth and war. It is dramatic viewing and highly recommended for anyone who lives in the United States or on the earth...Suitable for high school and college courses in cultural anthropology, development anthropology, environmental anthropology, Native American studies, and American studies, as well as general audiences." "It's not such a pretty picture. . . nor is the story behind it, but writer-director Matt Myers, who grew up just 25 miles away, could find no peace until he told it...A hard-hitting environmental documentary." "Engrossing...This eye-opening program documents this environmental disaster and the human costs of mining practices." "A searing portrait of human and natural damage wrought by one of the largest zinc and lead mines on Earth...The story is powerful...This film would be useful for environmental writing classes, or anywhere people need to be reminded that mining has a profound human cost." "This award-winning video follows negotiations for a buy-out and relocation of local nonnatives...[A] grim exploration of our toxic legacy...Doesn't spare mine owners, bureaucrats, or politicians." "A powerful documentary...The film recognizes the societal importance of the lead, zinc, and other metals that were extracted, but it raises important questions about the severe costs, many of which continue to be borne decades after production has ceased...Presents a strong, multipronged scientific case that touches on human biology, hydrology, ecology, geology, and atmospheric science...The science is well researched and credible, and the social story is compelling." Includes SDH captions for the deaf and hard-of-hearing plus scene selection.